Infrequent or prolonged menstrual periods, excess hair growth, acne, and obesity can all occur in women with polycystic ovary syndrome. In adolescents, infrequent or absent menstruation may raise suspicion for the condition. The exact cause of polycystic ovary syndrome is unknown. Early diagnosis and treatment along with weight loss may reduce the risk of long-term complications, such as type 2 diabetes and heart disease. Polycystic ovary syndrome signs and symptoms often begin soon after a woman first begins having periods (menarche). In some cases, PCOS develops later during the reproductive years, for instance, in response to substantial weight gain. PCOS has many signs — things you or your doctor can see or measure — and symptoms — things that you notice or feel. All of these can worsen with obesity. Every woman with PCOS may be affected a little differently. Irregular periods. This is the most common characteristic. Examples include menstrual intervals longer than 35 days; fewer than eight menstrual cycles a year; failure to menstruate for four months or longer; and prolonged periods that may be scant or heavy. Excess androgen. Elevated levels of male hormones (androgens) may result in physical signs, such as excess facial and body hair (hirsutism), adult acne or severe adolescent acne, and male-pattern baldness (androgenic alopecia). Polycystic ovaries. 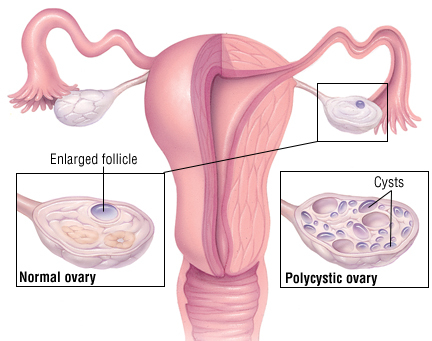 Polycystic ovaries become enlarged and contain numerous small fluid-filled sacs which surround the eggs.